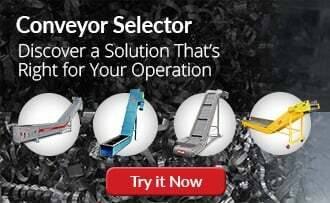 Move hot, dry or wet abrasive metal scrap or finished parts with an oscillating scrap conveyor. Vibrating scrap handling systems are ideal for moving hot, dry or wet abrasive metal chips, die scrap, or finished parts across horizontal distances at roughly 12.5 feet per minute. Low cost, economical choice for small to large size shops. Built for machine-side or in-pit operation. 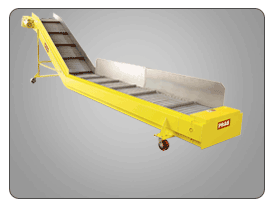 PRAB conveyors minimize safety risks by decreasing forklift traffic and scrap contact with operators. PRAB conveyors have the industry’s leading reputation as being dependable low-maintenance equipment with long service lives. 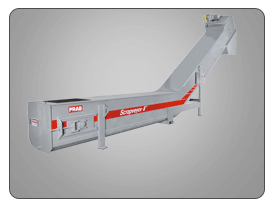 PRAB conveyors reduce downtime by automating the scrap transfer process- maximizing machine operator production time. 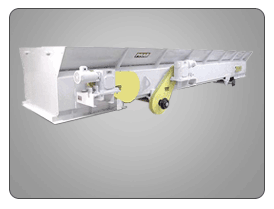 This oscillating scrap conveyor is the top choice for transferring hot, dry or wet abrasive metal scrap, chip processing or moving finished parts across horizontal distances. This scrap handling system provides a steady movement of material at roughly 12 1/2′(3.81 meters) per minute. 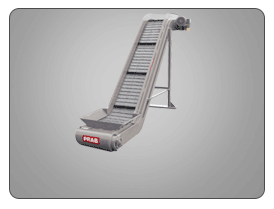 Choose from PRAB’s three Oscillating Scrap Conveyor models. See chart below for detailed information.